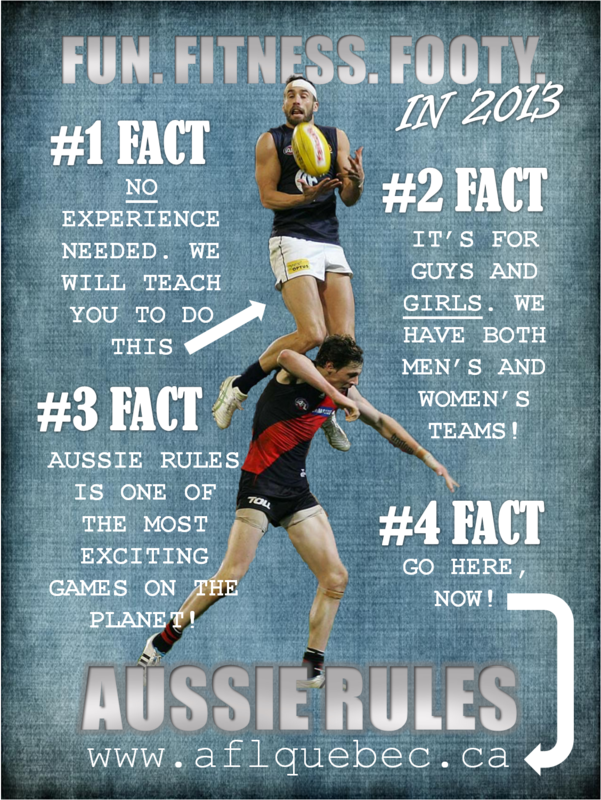 AUSSIE RULES INDOOR TRAINING BEGINS! And so it is, after a long winter break of nothingness, FOOTY IS BACK. 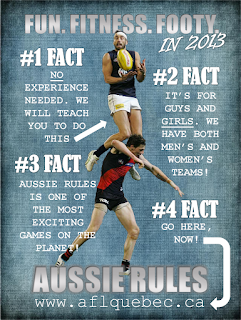 AFL Quebec 2013 season starts Monday 4th February 2013 at 8.30 at College De Montreal with our first official indoor practice of the year - And guess what? We want you to be there! And who is you? You, can be anyone. You can have played the game before for years or you may never even have heard of the sport before. Whoever you are AFL Quebec welcomes you to come train with us. Whether you want to learn a new sport, get fit, or even just come for the social side of things, we have room for you. After the great success of last years indoor programme where we introduced and taught the fantastic game of Australian Rules football to so many new people we have gone one bigger and better this year and booked both gyms at College de Montreal. We will also have some top quality coach’s on board as well as a lot of experienced players eager and willing to teach the game. So invite all your friends and family and mark down the following dates for what is sure to be a great experience.